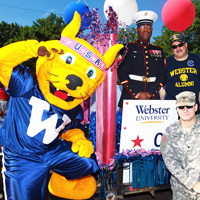 The Office of the President invites members of the Webster University community (faculty, staff, students, alumni and their families) are invited to participate in the City of Webster Groves’ Community Days Parade on Wednesday, July 4, and represent the University in this major community event. Energetic walkers are needed to hand out small items to the crowd during the parade on July 4. The route, lined with enthusiastic revelers, is approximately two miles long and takes about 70 minutes to complete. Rides will be provided from the end of the parade route (the Webster Groves Recreational Center) back to the parking lot behind Webster Hall. Walkers will gather behind Webster Hall at 9:15 a.m. before going together to the staging area, usually on the north side of Lockwood Ave., in front of Holy Redeemer School (341 E. Lockwood). Dress code is casual and comfortable. Walkers are encouraged to wear their own Webster University attire. Come have fun, show your pride for Webster University and celebrate Independence Day at the Community Days Parade on July 4! If you would like to participate as a walker or as a wheel-walker (monitoring float vehicle safety), please contact Jennifer Starkey, director of Community Engagement, at jenstarkey@webster.edu, including your name/guest name(s), Webster affiliation/title/department, phone and email.